Sidney Bechet was the first great jazz soloist and first American to make jazz popular in Europe. Sidney Bechet (May 14, 1897 – May 14, 1959) was a jazz saxophonist, clarinetist, and composer. Born in New Orleans, he was largely self-taught on clarinet but did study some with George Baquet and Big Eye Louis Nelson among others. The famous Jimmy Noone was a clarinet student of Bechet's although Noone was 2 years older. From 1914 to 1916 he toured Texas and other southwest states with Clarence Williams and Louis Wade. In 1916 he returned to New Orleans and played in King Oliver's Olympia Band. In 1917 Bechet arrived in Chicago where "New Orleans" jazz was blossoming and he played in bands led by Freddie Keppard, King Oliver and Lawrence Duhe'. Will Marion Cook heard him play and recruited him to join his Southern Syncopated Orchestra for a tour of Europe. That tour lasted 2 years and Sidney was a featured soloist although he could not read music. He received great reviews on this tour and it was on this tour that he found and bought a soprano saxophone. The cornet had traditionally been the lead melody instrument in jazz bands, in part because of its volume. He had chafed on clarinet because he was limited to counterpoint by volume and the soprano sax freed him of the constraint on his volume. He could now play lead in combo playing and the soprano sax became his main axe. He played the horn with a wide vibrato and strong melody lines. Sidney Bechet was the only giant playing primarily soprano sax until John Coltrane made it popular again in the early 60's. He had a great influence on Johnny Hodges who was his student and who later became a featured soloist on alto sax with Duke Ellington. 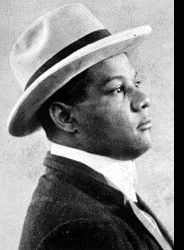 Sidney Bechet returned from Europe to New York in 1921 and roamed between Europe and New York for the next few years. In 1924 he played for a few months with Duke Ellington's band and is credited with helping to lead it from playing jazz-flavored popular music toward playing jazz. In 1924 and 1925 he made a number of recordings with Louis Armstrong issued as Clarence Williams Blue Five and Red Onion Jazz Babies. These are some of the greatest recordings of early jazz and he maybe outswings Armstrong! These recordings are contained in Clarence Williams 1924-1926. He continued to wander the USA and Europe and his musical fortunes took a downturn in the 30's when his music seemed dated. However, the New Orleans revival in 1939 brought him back to the fore and to critical acclaim as a jazz pioneer. In 1951 Sidney Bechet finally settled in France where he made many more recordings. He lived out his life a celebrity in France and dictated his autobiography shortly before his death from cancer in 1959.